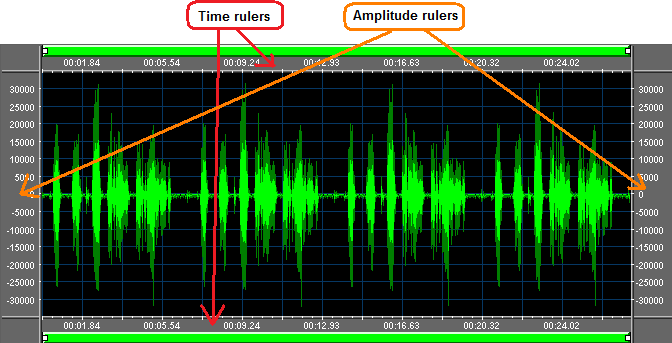 The WANALYZER_RULERS_SETTINGS structure describes settings applied while rendering the time and amplitude rulers on the Waveform Analyzer. The current settings can be retrieved through the WaveformAnalyzer.SettingsRulersGet method and modified through the WaveformAnalyzer.SettingsRulersSet method. Scale used for vertical rulers indicating waveform amplitude. Boolean value that specifies if the left amplitude ruler is visible. Boolean value that specifies if the left amplitude ruler has ticks. Boolean value that specifies if the right amplitude ruler is visible. Boolean value that specifies if the right amplitude ruler has ticks. Boolean value that specifies if the top time ruler is visible. Boolean value that specifies if the top time ruler has ticks. Boolean value that specifies if the bottom time ruler is visible. Boolean value that specifies if the bottom time ruler has ticks. Color used for rendering the rulers background. Color used for rendering rulers ticks. Color used for rendering rulers texts. Height of the top time ruler in pixels. The default value is 16 pixels. Height of the bottom time ruler in pixels. Width of vertical amplitude rulers in pixels. The default value is 41 pixels. Frequency of the time ticks in pixels. The default value is 40 pixels.